With the fall and winter hunting seasons over, it’s now “tag application season” for next year’s hunts, especially for most western states. In fact, even now it’s too late to apply for some species tags. For instance, in Wyoming the last date to apply for elk was January 31st so it’s a good thing I wasn’t planning to go after elk there next fall. What I am planning is a combined antelope and mule deer hunt there in the Cowboy State with my good friend Brian who lives in Cheyenne. In the past the deadline to apply for deer and antelope was in March, but this year the deadline has been moved out to May 31st. Even though the deadline isn’t looming, I still want to get the application in, and if you’re interested in hunting in Wyoming, you’ve got time to plan and apply as well. One thing that’s really great about hunting in Wyoming is the relatively low prices for non-residents to hunt there, especially if you’re hunting antlerless animals. Since I’m out for meat for Bobbie Jo’s kitchen, my trophy is a cooler full of meat in checked baggage instead of a set of antlers to bring back home. 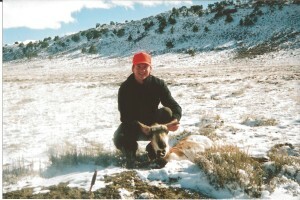 Here’s a picture of my first doe antelope I got there a few years ago. In Wyoming this year the fee for a non-resident license is only $48 for a doe antelope. For an antlerless deer it’s also $48 and a yearly conservation stamp costs about $13. My cost for this year will be just under $110. Not bad for two big game animals out of state. The Wyoming Game and Fish Department makes it easy now to apply for everything online at https://wgfd.wyo.gov. Just be sure to look for the “reduced price” tags for each species you want to hunt. The other good thing about Wyoming is the public access to hunting lands. 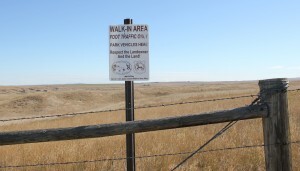 There are BLM, state lands, military bases and private “walk-in” areas that are open for public hunting. Landowners in this program are kind enough to allow access to hunters and in return they get a small payment for each animal taken on the land. 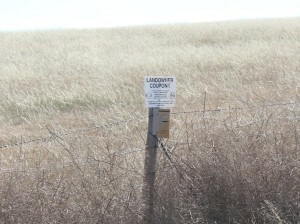 Often there’s a drop box right on the property where the hunter can drop off the land owner coupon portion of the tag after a successful hunt. 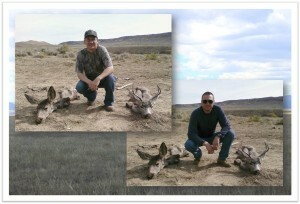 A few years ago Brian and I were successful hunting mule deer on private land that was open for public access. Of course mine was the doe while Brian got a nice buck during this hunt. I shot the doe right before sunset and we skinned them out in the dark in camp. Sometime in the morning we remembered to take a picture….. of the deflated carcasses. Better late than never! For each big game species Wyoming breaks up the state into many different hunt areas. Each area has a specific tag allocation for bucks and does and season dates so be sure to check carefully when applying. 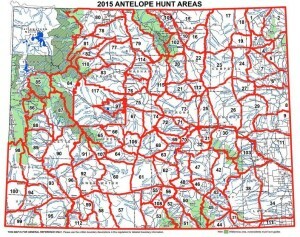 The Wyoming DFG website provides good information on public access areas and with Wyoming having both mule deer and whitetails, and more antelope than people (which is actually true depending upon the census year), it’s very doable to plan a relatively inexpensive hunt there with a good chance for success. However, to get an antelope or a deer on a DIY hunt, you should make a call to the Wyoming DFG if you don’t already have a contact in the state. They can direct you to public access areas as well as recommend some of the military bases that can be accessed during the season. They’ve been very helpful every time I’ve called with a question. Another option is to hire a guide, especially for your first trip there to stack the odds in your favor. As you know, guides don’t work for free, but luckily a guided antelope hunt or cow elk hunt can be found for very reasonable prices. As with any hunt, proper planning and a rifle with a good range are a must. In most cases you’ll be shooting antelope at distances of 200 to 300 yards. Not to say that it’s impossible to get closer, as many hunters can get close enough even using archery equipment. But they usually have to make multiple stalks and be lucky enough to have hills or at least folds in the treeless terrain to hide their approach. Most archery hunters use ground blinds near watering holes to stay hidden and let the animals come to them. Last year I took my 30-30 lever rifle to spot-and-stalk hunt for antelope and had only 2 days to be in the field. 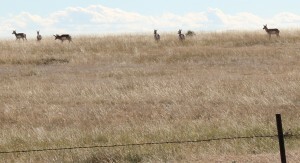 Needless to say I came back empty handed since I couldn’t get any closer than 325 yards to any antelope on that trip. Next year I’ll be sure to take my .270 with my new 4-16x scope to cover the distance. As for deer hunting, the 30-30 worked out well for the deer in the picture above since the terrain is usually more forgiving with trees and hills where the deer like to hang out. I shot this deer at a distance of about 170 yards which is about the maximum I will shoot at with the lever gun. With some luck I’ll be getting both the Wyoming deer and antelope tags in the June drawing. If not then, there is a 2nd chance opportunity to purchase left-over tags online in early July. That’s how I got my tag last year. Either way, I hope to be hunting with Brian in Wyoming next fall, creating more memories and bringing meat home for Bobbie Jo and me to enjoy. With some more luck and help from sponsors, we plan to film these hunts and the meals we make out of them for you to view and enjoy as well.